I can’t believe it has been so long so I last posted. I’ve missed blogging but it has all been rather hectic here. My book deadline was today so the last few weeks have been spent writing, checking, writing some more, stressing about the weather and having photos taken. I have discovered a subconscious ability to predict rubbish weather. If anyone has a big event planned in the future but the date has yet to be confirmed you could ask me to pick the date and then go with the following day. So far every photo shoot has been cold, dull and decidedly not spring or summer-like. But as soon as Jason, the photographer, has left the clouds part and the sun comes out. It could have been worse, so far we’ve yet to be rained off but I’m touching wood as I write this, as I still have one photo shoot left. So fingers crossed July is wall to wall sunshine. Yesterday I sent off the final draft of my book to my publisher. It was a strange feeling. With sweaty palms I spent quite a while rechecking and going to press the send button but not doing. A bit like when you’re a teenager wanting to phone up the boy/girl of your dreams but you can’t summon up the courage. It’s not as if I won’t see my words again. I now face the quite scary prospect of the editing process. But between now and October it should all start to come together and I’m really excited. Hopefully soon I should be able to say a bit more about it but for now I still have to keep it secret. As well as the book it has been busy, busy, busy with plants. I’ve just about managed to keep up with the allotment. Of course there’s nothing like the prospect of having photos taken to spur on a weeding frenzy. My lettuce supply so far this spring and summer has been bountiful. I have more baby leaves coming through so I’m hoping for the holy grail of successional sowing this year . . . well with salads at least. I’ve been picking mangetout for the last few weeks and my broad beans are looking really healthy and are tantalizingly close to picking. I’ve even got round to netting my blueberries and tayberry. Last year the blackbirds stripped 2 blueberry bushes dripping in unripe fruit. We didn’t get any, not a sausage. Much as I love birds and they do a good service in ridding my plot of slugs and snails I wasn’t planning on providing them with such fruity delights. I had looked into proper fruit cages but was taken aback at how expensive they are. So with Wellyman’s help we used some coppiced hazel poles and bamboo canes and made our own constructions for a fraction of the price. It was a bit of a faff and like any DIY job it always takes so much longer than you planned for. Hence us still being at the plot at 10pm one night wrestling with fruit netting. Not everything has worked quite so well. The topsy-turvy weather has meant some plants have sulked. 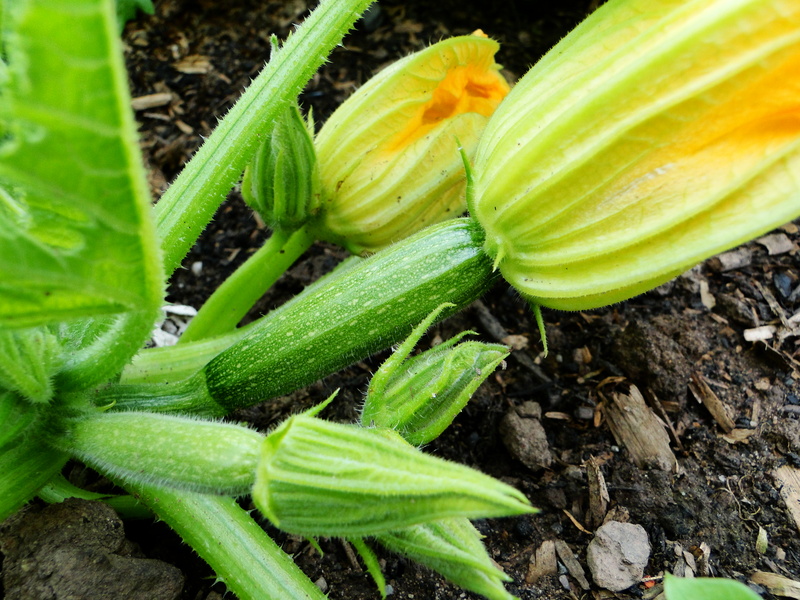 The courgettes are finally looking happier but my squashes are still sitting there doing very little. The ornamental hops that I planted to grow along a trellis panel have not taken kindly to the gale force winds that battered the plot in mid-June when the weather resembled November and not the start of summer. Still, there are always winners and losers. We all dream of that perfect year when everything grows well, but I’m coming to the conclusion that it’s just a pipe dream, the dangling carrot that brings us back for more each spring. I always think that this is a strange time of year. It feels as if the summer has only just got going, in it’s typically British unpredictable way but in so many ways the garden is what it is now for the rest of the season. The cold spring this year really compressed that short window of opportunity we have to sow, plant and divide. I catch myself thinking ‘oh I wish I’d grown that this year’ or ‘why didn’t I think of that?’ Then curse myself that I’ll have to wait until NEXT spring now to carry out those ideas. Still that’s what it is all about. I really must find a notebook though and write down those ideas. After a busy week and limited gardening over the last month due to torrential rain and the fact it has been flipping cold I finally managed, this weekend, to spend some time in my garden and at the allotment. Much of the work at this time of year seems to revolve around my packed window sills and the 2 cold frames, shunting plants about trying to maximise growing conditions and hardening plants off, so it feels good to get planting and get my hands on some soil. This spring has been in complete contrast to last year, when, after a warm April I had plants bursting out of pots and with no more space to pot them on and seeds didn’t germinate at the allotment because it was so dry. The cold temperatures recently have meant little plant growth and seeds haven’t germinated this time because it hasn’t been warm enough. My biggest concern though is whether, with a holiday coming up in June, some plants will be ready to plant out. Half hardies such as rudbeckia and verbena rigida have struggled and are little more than 5cm tall with only a few true leaves. Last year they were about 20cm tall and good substantial plants. Hopefully the warm weather that has been forecast for this week will encourage them to put on some growth, I really don’t want to have to take any plants on holiday this time! At the allotment my Charlotte potatoes are shooting up and the shallots are looking good despite all the rain (they are not meant to like it too wet). 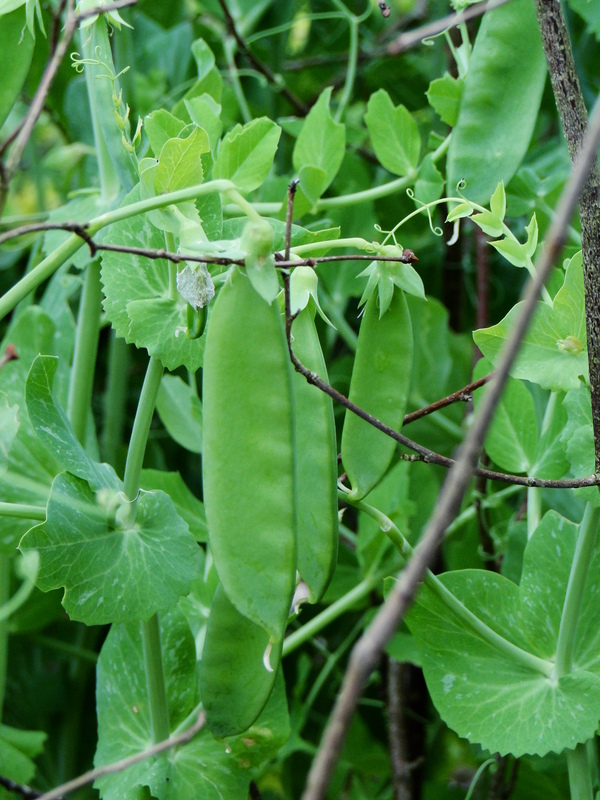 The broad beans and peas have both recovered after their mauling by weevils, although the cold weather looks like it has affected pollination of the broad beans as some of the flowers so far haven’t set. Quite a few flower seeds sown directly have refused to germinate so I’ve resorted to sowing in seed trays at home. It’s always a frantic time as I start to panic and think I won’t have enough to fill the plot, particularly with my cutting patch. I end up rummaging through my seed tin and digging out seeds and sowing more. Ammi visnaga, for instance, has proved disappointing in the germination stakes, not one plant out of 3 batches sown so far. In desperation for something that will create that light airy feel to my arrangements I found a packet of gypsophila and sowed those. Some Russian red kale plants went in and I got the chance to use one of my Malvern purchases, metal hoops from a company called Plant Belles, to create some protection from cabbage white butterflies. The hoops simply have loops in them so that you can push through bamboo canes and by placing hoops at intervals along your bed you can create a tunnel over which you can drape fleece, environmesh or clear plastic, depending on your requirements. I also planted out a patch of bupleurum, which is a bit like euphorbia but without the milky sap. It will, hopefully, provide some foliage for my flower arrangements, that’s if the slugs don’t get to it first like they did 2 years ago. It’s looking like it’s going to be a good year for fruit with my blackcurrants, gooseberries and blueberries covered in small fruit. I’m particularly looking forward to sampling tayberries. Last year was the tayberry’s first year and we only had one fruit from it which we halved and ate, to be honest it was such a small piece of berry that it was hard to get a real taste sensation. However, this year looks much more promising with the canes covered in flowers, all about to open. The biennial flowers I sowed last summer to provide some early colour are starting to bloom and my patch of sweet williams are poised. So all in all, things are looking promising and with predicted warm weather it’ll hopefully feel more like May this week than November. The soft fruit on the plot has been a big success even though it has been our first year. We’ve got 2 blueberries which were freed from the pots they had been in for a couple of years and put them into raised beds with ericaceous compost. We planted 10 autumn fruiting raspberries canes and 1 tayberry plant. 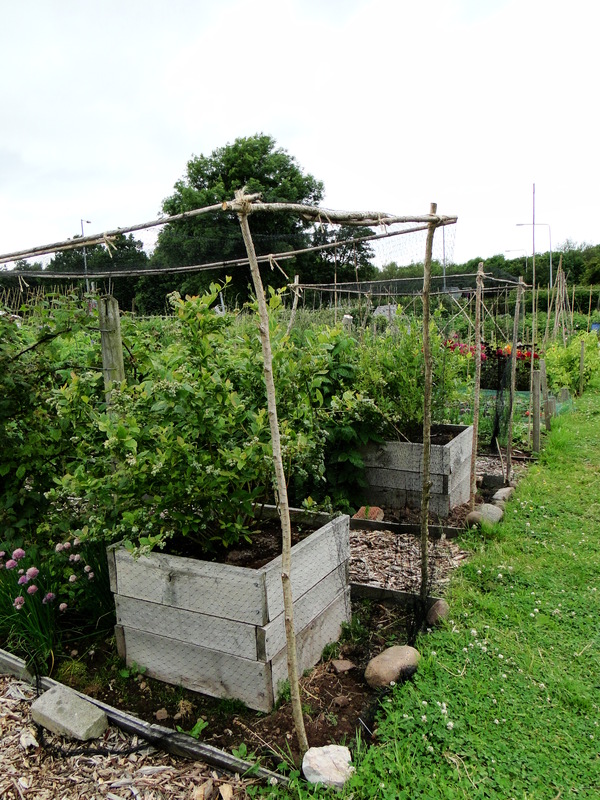 We also inherited 3 rows of strawberries, a gooseberry and 2 blackcurrants. I think growing your own soft fruit is brilliant value for money. Soft fruit is expensive to buy and if you want organic even more so. Non-organic soft fruit are some of the worst offenders for chemical residues so to grow your own safe in the knowledge you haven’t sprayed them is a great advantage. I’ve also been really surprised by the taste of our own fruit. The strawberries and raspberries have tasted so much sweeter. So to build on this collection I thought I would look for a hybrid blackberry. We often pick blackberries from the hedgerows but I find these smaller fruit are best cooked but the bigger, juicier hybrid berries are lovely fresh and scattered over porridge or Greek yoghurt. The problem with these hybrid berries is that you don’t get any fruit in the first year because they produce fruit on canes produced the previous year like summer fruiting raspberries. For an impatient gardener such as myself, that prospect isn’t very appealing. We had 1 paltry tayberry this year. I split it so we could both get a taste of it, which tantalised and teased us for the proper crop next year. Then I discovered the answer to my problems, a new variety called Blackberry ‘Reuben’. It’s a primocane variety which means it fruits on that seasons growth so if I plant it this autumn I will get fruit next year…yey!!! It produces big, tasty fruit so even better and is compact so useful for a small garden or plot. It’s also possible, once the plant is established, to get 2 crops from primocanes. You would normally prune primocanes in late winter/early spring, pruning out the canes from the previous year but if you leave these you will get a small crop in June these can then be pruned out and the plant will then crop normally on the new canes it has also produced. What more could I want? So I ordered 1 plant and I should have it within the month. Now all I have to do is work out where I can put it. Blackberry ‘Reuben’ is available from Pomona Fruits.